Annapolis Summer Garden Theatre with Maestro Leslie Dunner as Feste, the all-knowing fool. What would you do for love? Wear Malvolios yellow stockings and crossed garters? Conceal your true identity, as Viola does? Would you fight off desires madness? Or, like Olivia, on discovering that your true love has an unexpected twin, would you simply throw up your hands, give in to the madness and cry with joy, How wonderful!? Most of us need go no farther than Annapolis Summer Garden Theatres production of William Shakespeares Twelfth Night to spend a night suffused in the madness of romantic comedy under the stars. After a night of laughter, we get to leave the shipwreck of insanity behind. A shipwreck sets the play in motion. Viola (Hayley Clark) finds herself cast ashore in a foreign land called Illyria, where she fears her brother, Sebastian (Jon Christie) is dead. The Captain (Greg Ealick) rescues Viola and helps her (disguised as a man, Cesario) find work with Orsino, the Count of Illyria (Daniel Lavanga). Meanwhile, Count Orsino is pining for the Lady Olivia, who rejects his offers of love as she remains in mourning for her dead brother. Mourning doesnt prevent Olivia from falling in love with young Cesario/ Viola instead. Viola, of course, falls in love with Orsino. And Violas brother Sebastian (Jon Christie) makes a surprise appearance just in time to mislead everyone about precisely who is doing what with whom. Along the way, Olivias servant Maria (Lauren M. Kirby) conspires with Olivias drunken uncle Sir Toby Belch (Sean Brown) to outwit  and humiliate  Olivias prissy butler Malvolio (Barry Genderson) while Sir Andrew Aguecheek (Daniel Hackler-Sullivan) plays sidekick to Toby Belch and Feste (Leslie B. Dunner) plays everyone for a fool. 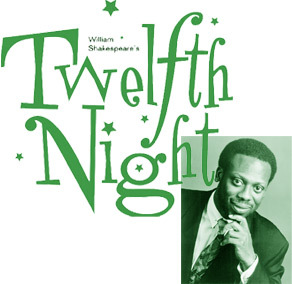 With its plot turning on mistaken identity, gender-bending disguises and the heartache and hilarity that can result from unrequited love, Twelfth Night is regarded as one of Shakespeares finest romantic comedies. Annapolis Summer Garden Theatres modern-dress production of this classic delivers all the intricate situational humor of the original in a setting calculated to make the Elizabethan verse more accessible to modern audiences. The adaptation succeeds. Costumes, designed by Nikki Gerbasi, are both witty and appropriate, offering the audience clear signals about the station and nature of each character, from Orsinos polo shirt and golf shoes to Andrew Aguecheeks Hawaiian print shirts; from Olivias tailored fashions to the bow tie and ill-fitting suit that leave Malvolio looking scruffy and uptight at the same time. The sets, designed by Peter OMalley, Anne Rottenborn and Bill Smith, make effective use of the space and dovetail nicely with the theaters own setting. Olivias Victorian-style house and Orsinos pub-like villa could easily have been plucked from the red-brick streets surrounding Annapolis City Dock. Director Anne Rottenborn has assembled a talented cast that delivers a fine performance: polished, lively, and  essential with Shakespeare  generally easy to understand, thanks to clear enunciation and expressive delivery. Hayley Clarks Viola perfectly captures the impetuous impatience of the adolescent male, Cesario, whom she portrays. Barry Gendersons Malvolio works a transformation from simpering, prudish servant to wronged and vengeful enigma by the plays end. Olivia is delightfully lascivious, flighty, self-absorbed. Leslie Dunner  music director for the Annapolis Symphony Orchestra  brings manifold talents to this production with his composition of original music, adaptation of traditional music and the singing and recorder-playing that broaden the scope of his fine portrayal of Feste, the all-knowing fool. Amongst this entire solid cast, the outstanding performance comes from Lauren M. Kirby, whose Maria is so natural, so expressive and so finely portrayed that the archaic language seems as natural  and therefore as easy to follow  as if she were speaking in modern dialect. Kirbys is truly a seamless performance. It is distracting, however, when Sir Toby, Andrew and Feste break into singing Rogers and Hammersteins So Long, Farewell, from The Sound of Music. Theater liberalists will find it a clever pun, but traditionalists will object that its not an effective one, as it has the same jarring effect as watching an actor (or, here, a production) slip, however briefly, out of character. Overall, Annapolis Summer Garden Theatre delivers a delightful detour through romantic madness with this lively and well-wrought production of Twelfth Night. Playing thru July 27 at 8:30pm ThSu @ Annapolis Summer Garden Theater, across from City Dock. rsvp: 410/268-9212. Jonathon Glickman as Nathan Detroit and Nori Morton as Miss Adelaide. Before a packed house Saturday night (Saturday June 8 is also sold out), da guys and der dolls took the Bowie Playhouse stage hostage and captured the audience. 2nd Star Productions season ends with a rip roaring Guys and Dolls that is perfectly crafted, all pieces fitting together in perfect form: scenic design, sound and light, music, staging and casting. Guys and Dolls, first produced in 1950, has enjoyed many revivals: an all-black version in 1976, a Broadway production in 1992 and a hit show at Washingtons Arena Stage, starring Maurice Hines, in the 1999-2000 season. Now here it is in Chesapeake Country. Based on the characters from The Idyll of Miss Sarah Brown, part of Damon Runyons Guys and Dolls collection, the play highlights Runyons fascination with the gangsta life. His relationship with mobsters such as Al Capone gave him the experiences to imbue his characters with the quirks that make nefarious criminal behavior comedic, while menace is hidden under wisecracks and simplicity. Nathan Detroit (Jonathon Glickman), the organizer of the oldest established permanent floating crap game in New York, is broke. He needs $1,000 up front to hold his crap game at Biltmores Garage. The way hes going to get it is by betting Sky Masterson (Andrew Baughman), renowned high roller, on a sure thing. Masterson, Detroit bets, will never be able to get Sarah Brown, uptight Salvation Army recruiter, to Havana. Meanwhile, Detroit has another problem. Hes been engaged for 14 years to Miss Adelaide (Nori Morton), star of the Hat Box Club. Shes getting a little impatient. Weaving in and out of the above dilemmas are an assortment of mobsters, petty criminals, show girls and Salvation Army soul-savers. The laughs are irrepressible with such characters as Big Jule (Dave OBrien), the tough Chicago mobster with 33 arrests and no convictions and dice with no dots (he remembers where they are); Nicely Johnson(Patrick Bangs), the lovable mild-mannered gofer; and his small-time gambler pal Benny Southstreet (Jim Reiter). There isnt a weak spot in this cast of 34  who have just as much fun with the words and music as the audience. Glickman is an ideal Nathan Detroit. He can plead, cajole, manipulate and charm with his physical comedy style and mobile mug. Nori Morton can hold her own with any actress cast as Miss Adelaide. She not only has the great figure of a show girl, she also turns on all the dipsy-do, high-pitched, little-girl mannerisms needed for this role. Her interpretation of Adelaides Lament (a person could develop a cold) and Take Back Your Mink are priceless. Shes funny and poignant at the same time. Sheri Kuznicki, the Sound of Musics elegant Baroness, appears in dowdy Salvation Army clothes, but her lovely face and clear resounding voice cant be hidden. Her duet with the swarthy Sky, Ill Know, is a lovely romantic moment. Comedy takes a back seat as Kevin Buter, the Salvation Armys Arvide Abernathy, entreats Sarah to take a chance on love. His rendition of More I Cannot Wish You, is rich with sentiment. The perfectly crafted pieces include Lynn E. Wilsons set design: the skyline of New York, the palm trees of Havana and a New York sewer whose pipes lead the eye into the deep. Garrett R. Hyde bathes the sets with lighting that moves the action from daylight to darkness. His red tones eerily shadow New Yorks underground. Linda Swanns costumes  flashy suits and ties in maroons, golds and purples, topped off by the ever present fedoras for the guys and sparkly dresses, boas and night-club costumes for the dolls  further the sophisticated, city atmosphere. Vickie Smiths choreography uses the casts strengths effectively. Guys and Dolls closes 2nd Star Productions season on a happy note. Co-founder John Guyton, recovered from a stroke, is back co-directing and appearing on stage. To next seasons opening show, Neil Simons London Suite, a season subscription will guarantee a seat. Playing thru June 29 at 8pm FSa; 3pm Su @ Bowie Playhouse, White Marsh Park on Rt. 3 South. $15 w/age & group discounts; rsvp: 410/757-5700. 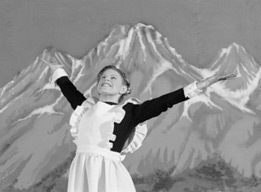 Exalting in the Sound of Music is Kathrine Riddle as Brigitta, above. 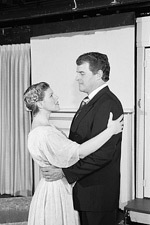 Right: Jason Fulmer as Captain Georg von Trapp and Danielle Spiziri as Maria Rainer. Once in a great while, a performance is so fine that the review almost writes itself. Chesapeake Music Halls The Sound of Music, running now through June 29, is that rare kind of show. The Music Halls exceptionally talented cast breathes fresh air into this classic family musical about honor, courage, serendipity and faith. For all the fine costumes, sets and lighting, it is the energetic and polished performances of the cast that make this evening of dinner theater such a treat. Danielle Spiziri performs the lead role (remember Julie Andrews?) of Maria Rainer, a would-be nun who is assigned to be governess to the seven children of Austrian autocrat Georg von Trapp (Jason Fulmer). With her nice comic timing and broad, loving smile, Spiziri seems perfectly cast in the role of the governess any kid would want: a sort of a lenient and conspiratorial favorite aunt. Its no mean feat to fill the shoes of Julie Andrews and yodel to boot, but Spiziri does a fine job of both. Her formal voice training is evident from her very first song (the plays title song), when Spiziri resists the all-too-common temptation in community theater to oversing. Instead, she begins in an almost restrained fashion, leaving the audience eager for more of the gloriously warm and pure-pitched singing she delivers throughout the show. Playing opposite Spiziri is Jason Fulmer, whose understated approach lends Captain von Trapp an aura of decency and kindness that makes him, even at his most paternally autocratic, touchingly human. Fulmers singing is rich, melodic and heartfelt, and his performance of Edelweiss near the shows end brought many in the audience near to tears. Captain von Trapps seven children are played by a terrific band of local kids who give performances as polished as those of many adults in local theater. (The roles of the six youngest children are split into two casts, with each cast of children performing on alternating weekends.) The oldest child, Liesl, is played by Nicole Allen, whose performance is one of the standouts in this show. She performs with the exuberance of the teenager she portrays, but she sings with a mature, accomplished voice. Its no surprise, then, that Liesls duet with Rolf Gruber (Ronnie Schronce), Sixteen Going on Seventeen, has the infectious energy of a high school crush, or that Leisls duet with Maria, a reprise of the same song, is among the most beautifully performed in the show. And who can resist when all seven children sing Do-Re-Mi or snuggle in Marias bed through a thunderstorm singing My Favorite Things in what looks like the coziest pajama party ever seen on stage? There are simply too many highlights in this production to give them all adequate mention. Suffice it to say that Connie Bowman is perfectly patrician as the comic snob Baroness Schrader. Alan Hoffman turns in a fine piece of character acting in his portrayal of von Trapp family friend Max Detweiler. Kevin Wheatley is utterly chilling as Nazi henchman Herr Zeller (this role is split with Thurman Rhodes). Katy Smith is flighty and funny as Sister Margaretta, while Mary Armour-Kaiser performs the role of Sister Berthe with her usual energy and comic flair. Judy Smith pulls a delightful double-play in her roles as Sister Johanna and housekeeper Frau Schmidt, and Peg Blacker sings beautifully in her role as the Mother Abbess (a role split with Melynda Burdette). This final collaboration between Rodgers and Hammerstein made the Trapp family singers famous world wide. The play won eight Tony Awards, including Best Musical, Book and Score, and the movie version became the most popular movie musical of all time. Chesapeake Music Halls outstanding production of The Sound of Music brings back to life the magic of this now-classic tale. Directed, produced and choreographed by Sherry Kay Anderson. Assistant director: Tere Fulmer. Musical director: Anita OConnor. Costumes: Judi Drinks. Sets: Karel Richardson and Michael McGranahan. Lighting: Garret R. Hyde. Performers in Moon Over Buffalo: Ed Kuhl as George, John Parry as Howard and Heather Tuckfield as Charlotte. How the mighty have fallen. Charlotte (Heather Tuckfield) and George Hay (Edward Kuhl), former stars, are playing rep in the city of Buffalo, New York. Its the Green Room  where actors gather when not on stage  of Erlanger Theatre in Buffalo most of the action takes place. George has dallied with young star Eileen (Nancy P. Dall), who becomes pregnant. Charlotte is pursued by lawyer Richard Maynard (Jack Degnan). Daughter Rosalind (Dani Wildason) drops by with her fiancée weatherman Howard (John Parry). Meanwhile, Rosalinds ex-lover, company actor Paul (Todd Cunningham) has the unenviable task of peacemaking between the Hays while winning back Rosalinds love. Into the mix Ludwig throws Georges mother-in-law, Ethel (Irene Patton). As the Hays and company struggle in Buffalo, Ronald Coleman has broken his legs while filming in Hollywood. George is being considered as Colemans replacement. Famed movie director Frank Capra (Its a Wonderful Life) is on his way to Buffalo to watch Georges performance. In one of many little mistakes in a series of side-splitting gaffes, weatherman Howard is mistaken for Capra. Mistaken identity, marital infidelity and too much booze all mix together on a set with four doors and two hallways. Thus a hilarious game of hide and seek ensues. Moon Over Buffalo is not as high energy and stylish as Lend Me a Tenor, but Ludwig has included plenty of laughs and a glorious drinking scene, which highlights Kuhls comedic talents. Kuhl is an expert at physical comedy as he hides behind the sofa, slinks along the floor or stretches out for a massage. His behind-the-back fun poking at his mother-in-law provides some of the funniest moments of the evening. As the mother-in-law and hard-of-hearing grande dame of a theatrical family, Patton demonstrates that mature actresses can perform with verve in the right role. She is hilarious in her interactions with George, her granddaughter Rosalind and Rosalinds fiancée. Patton has such a sly, off-the-cuff way of tossing her lines that Im sorry she doesnt have more of them. Flamboyant Heather Tuckfield plays the stars role to the hilt. She looks, moves and speaks like a true diva, exudes the fiery spirit first shown when she played Maria in Lend Me A Tenor. Then she was the fire cracker brunette Italian wife. Now shes the wronged blonde wife. Before a house packed despite a drenching downpour, 2nd Star continued its formula for stage magic: high energy, competent casting and lots of hiding places. Directed by Charles W. Maloney. Produced by Jane B. Wingard. Set design: Lynne E. Wilson. Lighting and sound design: Garrett R. Hyde. Costumes: Jane B. Wingard. With Al Chopey, Shannon Webber, Joanne Wilson.